Early in the morning of May 20, 1883, the captain of the German warship Elizabeth reported seeing an ~11-km-high cloud of ash and dust rising above the uninhabited island of Krakatau, thus documenting the first eruption from this Indonesian island in at least two centures. Over the ensuing two months, crews on commercial vessels and sightseers on charted ships would experience similar spectacles, all of which were associated with explosive noises and churning clouds of black to incandescent ash and pumice. From a distance, the largest of these natural fanfares impressed the local inhabitants on the coastal plains of Java and Sumatra, creating a near-festive environment. Little did they realize, however, that these awe-inspiring displays were only a prelude to one of the largest eruptions in historic times. A series of cataclysmic explosions began at mid-day on August 26, and ended on August 27 with a stupendous paroxysmal eruption. On this day, the northern two-thirds of the island collapsed beneath the sea, generating a series of devasting pyroclastic flows and immense tsunamis that ravaged adjacent coastlines. The events that began on August 26 would mark the last 24 hours on earth for over 36,000 people, and the destruction of hundreds of coastal villages and towns. Indonesia contains over 130 active volcanoes, more than any other country on earth. They comprise the axis of the Indonesian island arc system, which is generated by northeastward subduction of the Indo-Australian plate. 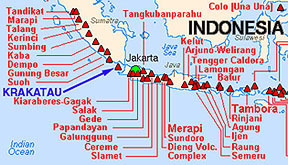 The great majority of these volcanoes lie along the topographic crest of the arc's two largest islands - Java and Sumatra. The islands are separated by the Sunda Straits, which is located at a distinct bend in axis of the island arc volcanoes, from a nearly east-west orientation in Java to a northwest-southeast orientation in Sumatra. Krakatau is one of a several volcanic islands in the Sunda Straits located above an active north-northeast trending fault zone, an orientation quite distinct from the main island-arc trend. Although relatively small when compared to the largest volcanoes along the island arc, Krakatau and its associated volcanoes have shown the capacity to generate highly explosive eruptions. The pre-eruption island of Kratatau was composed of three coalsced volcanoes aligned along a north-northwest direction, parallel to the volcanoes on Sumatra. From north to south, these were Perboewatan, Danan, and Rakata. During the eruption, Perboewatan, Danan, and the northern half of Rakata appear to have collapsed into the vacating magma chamber, thus forming a submarine caldera and destroying the northern two-thirds of the island. Some workers, however, have argued for an alternative to the caldron-collapse model, and instead have suggested that the caldera formed by explosive destruction of the island, and the reaming out of the pre-eruption edifice. Eruptions since 1927 have built a new cone called Anak Krakatau ("child of Krakatau") in the center of the 1883 caldera. 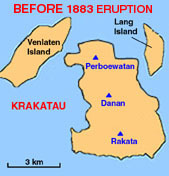 After reawakening on May 20, 1883, Krakatau generated mild detonations from Perboewatan throughout May and June. By mid-June the summit crater of Perboewatan had been largely destroyed and the cite of eruption widened to include several new vents near Danan. By mid-July, banks of pumice were common features found floating in the Sunda Straits. However, some of the earliest tephra was basaltic, indicating that recharge of basalt magmas into the magma chamber beneath Krakatau may well have played a role in the intiation of these early eruptions. Sunday, August 26. At 12:53 p.m., Krakatau delivered the opening salvo to a climactic eruption that would last throughout the evening of August 27. The initial blast generated an ear-shattering fusillade accompanied by a black churning cloud of volcanic debris that rose quickly to 25 km above the island. Over the next several hours, it would widen dramatically to the northeast, rising to a height of at least 36 km. The intensity of the eruptions increased throughout Sunday, frightening the coastal communities of western Sumatra, western Java, and adjacent islands. Later in the day, these villages would be battered by a series of devasting tsunamis generated by pyroclastic flows plunging into the sea. The worst was yet to come. Monday, August 27. This frightening display of volcanic power would culminate in a series of at least four stupendous eruptions that began at 5:30 a.m., climaxing in a colossal blast that literally blew Krakatau apart. The noise was heard over 4600 km away, throughout the Indian Ocean, from Rodriguez Island and Sri Lanka in the west, to Australia in the east. Two-thirds of the island collapsed beneath the sea into the underlying, partially vacated magma chamber. About 23 square kilometers of the island, including all of Perboewatan and Danan, subsided into a caldera about 6 km across. At an original height of 450 m, Danan had collapsed to depth of 250 m below sealevel. The cataclysmic blasts of August 27 generated mountainous tsunamis, up to 40 m tall, that ravaged coastlines across the Sunda Straits. Many of the closest islands were completely submerged. After first being overwhelmed by massive pyroclastic flows (see below), Sebesi Island northeast of Krakatau, was innudated by mammoth sea waves. These tsunami stripped away all vegetation, washed ~3000 people out to sea, and destroyed all signs of human occupation. Although located at seemingly safe distance, 80 km east of the Sunda Straits, the low-lying Thousand Islands were buried by at least 2 m of seawater and their inhabitants had to save themselves by climbing trees. "Suddenly we saw a gigantic wave of prodigious height advancing toward the seashore with considerable speed. Immediately, the crew . . .managed to set sail in face of the imminent danger; the ship had just enough time to meet with the wave from the front. The ship met the wave head on and the Loudon was lifted up with a dizzying rapidity and made a formidable leap... The ship rode at a high angle over the crest of the wave and down the other side. The wave continued on its journey toward land, and the benumbed crew watched as the sea in a single sweeping motion consumed the town. There, where an instant before had lain the town of Telok Betong, nothing remained but the open sea." Other ships in Lampong Bay were not as lucky. The wave lifted the steamship Berouw up the Koeripan River valley, depositing the ship over a mile inland, thirty feet above sealevel, killing all 28 of its crew members. Tsunamis were clearly responsible for most of the fatalities at Krakatau. However, ~4,500 deaths (over 10% of the total) have been attributed to falling tephra and hot pyroclastic flows. The amount of tephra generated is thought to be about 20 cubic kilometers, or twenty times that of the destructive Mt. St. Helens eruption in 1980. Near Sumatra, the Sunda Straits were clogged with so much debris that it looked like solid ground. Relief ships were unable to reach coastal communities like Telok Betong for weeks. Over the ensuing months, storms and high-tides would disperse thick banks of floating pumice beyond the Straits, into the Java Sea and Indian Ocean. Ships thousands of kilometers from Krakatau would report huge fields of this floating debris for months after the eruption. One such accumulation floated 8,170 km, until it reached Durban, South Aftica in September, 1884. About 2000 of the corpses in southern Sumatra had severe burns, indicating that they had been scorched to death, peresumably from pyroclastic flows. Although the behavior of pyroclastic flows and surges over water is poorly contrained by direct observations, the evidence suggests that they can travel great distances over open water. One compeling feature of the Krakatau eruption is that the pyroclastic flows appear to have travelled an incredible 40 km across the Sunda Straits, where they remained hot enough to cause the burn-related fatalities on Sumatra. These same flows, however, were also recorded by several ships located at greater distances. On August 27, the Louden (see above) was located ~65 km north-northeast of Krakatau when it was struck by severe winds and tephra, and the W.H. Besse was located at ~80 km east-northeast of Krakatau when it was hit by hurricane-force winds, heavy tephra, and the strong smell of sulfur. At these greater distances, the pyroclastic flows were at lower temperatures so that the ships and crew survived. How is it possible for pyroclastic flows to travel such great distances? Pyroclastic flows are hot mixtures of solid particles and expanding volcanic gases. While advancing over water, the base of the flow will conert the water to steam. The rapid expansion of water to vapor greatly enhances flow fluidization and inhibits the deposition of particles, particularly the low-density pumiceous particles, thus allowing the flow to travel tens of kilometers over flat oceanic waters. This mobility was first recognized during the 1902 eruption of a pyroclastic flow from Mt. Pelée, which destroyed the coastal city of St. Pierre, only to continue across open waters to overturn and burn ships anchored several kilometers offshore. "Suddenly, it became pitch dark. The last thing I saw was the ash being pushed up through the cracks in the floorboards, like a fountain. I turned to my husband and heard him say in dispair ' Where is the knife?' . . . I will cut all our wrists and then we shall be released from our suffering sooner.' The knife could not be found. I felt a heavy pressure, throwing me to the ground. Then it seemed as if all the air was being sucked away and I could not breathe. . . . I felt people rolling over me . . . No sound came from my husband or children . . . I remember thinking, I want to . . . go outside . . . . but I could not straighten my back . . . I tottered, doubled up, to the door . . . I forced myself through the opening . . . I tripped and fell. I realized the ash was hot and I tried to protect my face with my hands. The hot bite of the pumice pricked like needles . . . Without thinking, I walked hopefully forward. Had I been in my right mind, I would have understood what a dangerous thing it was to . . . plunge into the hellish darkness . . . I ran up against . . . branches and did not even think of avoiding them. I entangled myself more and more . . . My hair got caught up . . . I noticed for the first time that [my] skin was hanging off everywhere, thick and moist from the ash stuck to it. Thinking it must be dirty, I wanted to pull bits of skin off, but that was still more painful . . . I did not know I had been burnt." -- From A. Scarth, 1999. Tephra from the eruption fell as far as 2,500 km downwind in the days following the eruption. However, the finest fragments were propelled high into the stratosphere, spreading outward as a broad cloud across the entire equatorial belt in only two weeks. These particles would remain suspended in the atmosphere for years, propogating farther to the north and south before finally dissipating. The stratospheric cloud of dust also contained large volumes of sulfur dioxide gas emitted from Krakatau. These gas molecules rapidly combined with water vapor to generate sulfuric acid droplets in the high atmosphere. The resulting veil of acidic areosols and volcanic dust provided an atmospheric shield capable of reflected enough sunlight to cause global temperatures to drop by several degrees. This aerosol-rich veil also generated spectacular optical effects over 70% of the earth's surface. For several years after the 1883 eruption, the earth experienced exotic colors in the sky, halos around the sun and moon, and a spectacular array of anomalous sunsets and sunrises. Artists were fascinated by these aerial displays and captured them on canvas. The painting shown here is one such sunset captured by the artitst William Ascroft on the banks of the River Thames in London, on November 26, 1883 (Courtesy of Peter Francis). On December 29, 1927, a group of Javanese fisherman who were startled by steam and debris bleching from the sea above the collapsed caldera, thus marking the reawakening of Krakatau after 44 years of calm. The activity continued, and on January 26, 1928 the rim of a basaltic scoria cone first appeared above sealevel. 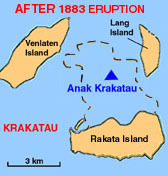 A year later, it had grown into a small island which was quickly dubbed Anak ("Child of") Krakatau. Anak Krakatau has erupted in most years since. Typically, these are rather mild strombolian to vulcanian eruptions of basaltic andesite lava flows and associated tephra deposits. Although they present little danger to surrounding islands, the eruptions from Anak Krakatau provide a constant reminder of the horror of 1883 - Lest we forget.